There are so many details to tend to in preparation for a one month trip: put a bucket in the bathroom in case the old, now repaired, leak decides to spring again; make sure the bees setting up house on my deck have truly moved on; clean out the fridge, take care of the plants, the mail, the newspaper, and all the other little responsibilities of home. My habit before leaving on any long trip is to clean, organize, sort, purge, and generally get my home into better shape. I’m not sure why it takes a long trip to stir up the passion for orderliness, but suppose it makes home a better place to return to at the end of vacation. I start my packing way ahead, too, by gathering everything together in one spot over the course of a couple weeks. These days, when I’m looking for something, I often find it on the guest bed, my current staging area. The other day I couldn’t find my kindle; it was already packed. I typically put it all out, pack it up in the suitcase, and then unpack and remove several items. 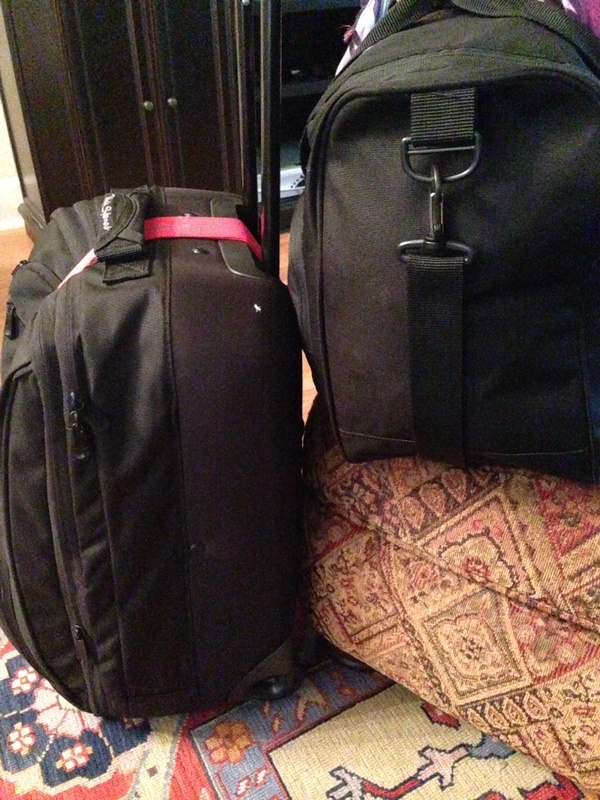 Since I only travel with one carry one bag and a tote, there’s no room for extras. All this planning ahead really paid off last year when my flight out was suddenly moved up several hours at the last minute due to a flight cancellation giving me about an hour to take a shower, load the car, and get to the airport, rather than the seven hours originally scheduled. I’m sure I’ve forgotten something, but at this point I’ve narrow it down to this and I’m ready to go. This entry was posted in France and tagged france, travel. Bookmark the permalink.